Norcold RV Refrigerator product line is one of the most important line of fridges for refrigerators for recreational vehicles and boats, along with Dometic and Carrier, since the seventies. Manufacturer is Thetford and their headquarters are located in Ohio. RV fridges are built with the idea to resist their usage even traveling through roads with miles of bumps. Norcold RV refrigerator is not an exception to this and will work in standard performance even when the surface is not completely flat and when the exterior temperature is hot. One advantage of an Norcold RV refrigerator unit in comparison to other brands is that they will automatically shift to function with propane gas when you are not utilizing shore power anymore. With more manufacturers incorporating this automatic switch, Norcold would be losing one of its distinctive advantages in their RV fridge line in the near future. The Thetford N3000 Series refrigerator has a beautiful design, with the RV in mind. Their larger models, such as the N3175, are suitable for a class A motorhome, and their smaller N3080 would fit in a teardrop camper. See the chart below provided by Thetford themselves. Just bear in mind that refrigerators built into the original equipment directly from the RV manufacturer may have different specifications. An example can be Forest River recreational vehicles. Its automatic functions, self-diagnosis system makes the N3000 line one of the most efficient RV refrigerators in today’s leisure market. The N3000 series has been developed with the most modern technology and Norcolds considers that they are designed and manufactured “…..with the needs of the user always present…..”. Standing at the forefront of market trends, the newly designed N3000 series has a control panel with touch screen. Its large service panel has clear and easy-to-use symbols. The lighting on the control panel lights up during use and then slowly fades. This eliminates the need to have a lamp constantly on that can be visually annoying. This Norcold RV refrigerator line defrost automatically. This prevents the formation of ice in the freezer. Therefore, you do not need to be scraping your freezer frequently to remove the ice. The unloading function, which is activated automatically, ensures that condensation does not occur between the two doors of the refrigerator. All the refrigerators have a self-diagnosis system. If a fault occurs, an error code will appear on the control panel. The design has been optimized and adjusted by our last check in 2018. The lightning has been placed under the control panel, so that you can always see the contents of the refrigerator. By using a single door you can also have lighting in the freezer. The bottle rack has no edges, thus facilitating cleaning without any inconvenience in my opinion. the Norcold RV Refrigerator N-3000 product line are all absorption refrigerators, as we briefly mentioned above. They operate through AC or gas. The LED refrigerators can work even with a 12 V battery. This allows you to use the refrigerator in virtually any situation. The control panel reveals the selected energy source. After automatically selecting the best available energy source, the refrigerator will start up. The flame is electrically ignited on all models. If the flame goes out accidentally, the refrigerator will restart in 2.5 seconds. It happened in about four seconds in my testing but nevertheless i think that this is a good performance. Absorption refrigerators are silent as a whisper. We explain it in our article about RV refrigerators as they work differently than your domestic refrigerator. Norcold RV refrigerators do not have compressors, which makes them quieter. This means that you can relax and enjoy a pleasant stay in your camper, travel trailer or teardrop, without the constant hum of the RV appliances in the background. There were recently some issues with some Norcold RV refrigerator lines, however none of them affected the N 3000 product line. It is important that you follow the instruction from Norcold to help with the recall. 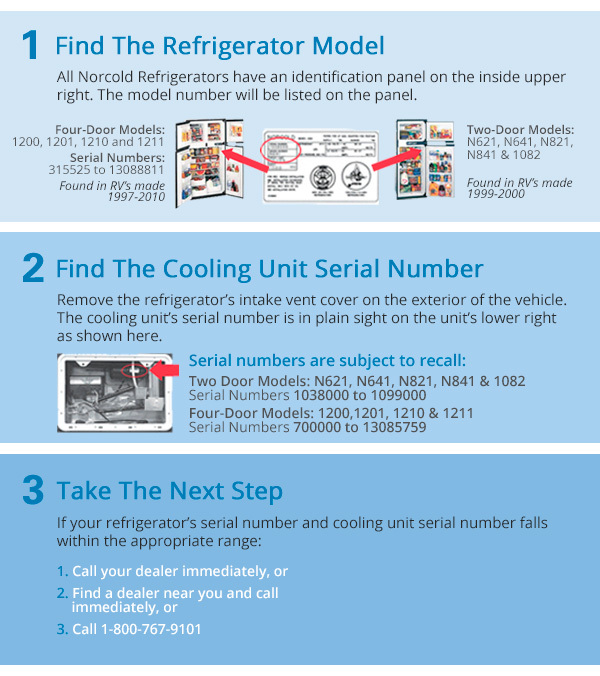 First you have to identify the model of your Norcold RV refrigerator located inside and then follow the steps in the graphic below and contact the dealer and Norcold. We have been receiving in the past some complaints from Norcold customers. They also mentioned in the forum comments, that the recall process was not clear for them. Nevertheless, as the new Norcold RV refrigerator models were not affected by these issues and were not subject to recall, these issues will gradually tend to disappear. These conversion charts for Norcold RV refrigerator models serve to define if a Norcold product will fit into an available space in your floorplan and which model from Norcold or Dometic can be replaced in which space. Norcold has warned many times that modifications in the cabinet may be required and that the dimensions established in the conversion charts to facilitate the replacement of the Norcold RV refrigerator are not in all opportunities an exact fit. Therefore, you always have to take your measurements, and take the Norcold conversion charts as an indicative advice. We use to say, measure thrice so you need to cut just once; so it feels safe to stick to that golden rule.